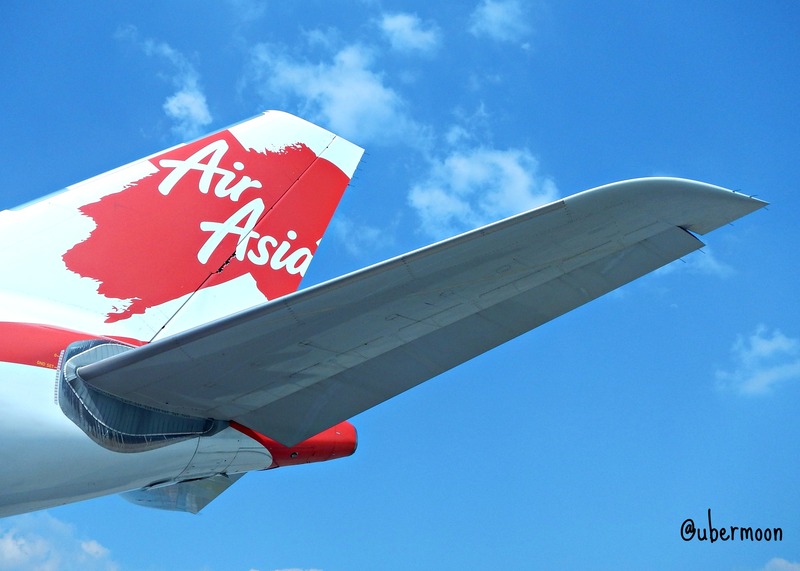 AirAsia X flew me to Nepal – No, I’m not sponsored. Though I don’t mind if they want to sponsor me. I stepped on the stairs from the back door of AirAsia X’s plane and looked to my right. I guessed we took too much time taking pictures in front of a small statue at the side of the ramp in Tribhuvan International Airport. The officer must has seen us for quite some times; busy with our poses and smile and camera and monopod. LOL. Enough already, he thought, so he blew the whistle. We got in to the aisle in the airport building that lead us to a busy Immigration Hall. People were standing here and there with a pen on their hands, filling in the Arrival Card while also chatting. Do you want Batik Passport Cover like mine? After filling out the Visa Application, I checked on the queue. There were several queues; being practical and impatient, of course I queued on the short one and wondering why people still queued on the long queue one. So smart, right! Being nice, I replied with my most amazing smile. Then Chocky, who was in the next counter looked a bit puzzled and talked to Panji and Angga who were still in the queue. I looked at them and knew there was something wrong. I looked at the counter he was pointing at and suddenly really wanted to laugh. Of course that queue was not long because it’s the queue for the Immigration. Before getting to that queue, we need to pay for the VOA first (superyayness, Indonesian can get in Nepal with just VOA!) in another counter with a long queue! HUAHAHAHAHA. Not-so-smart! So we queued again in the long queue one and spent another 30 – 40 minutes there to pay USD25/person for 15days Visa. Short queue doesn’t mean the RIGHT queue. Find the RIGHT one, not the short one! LOL! 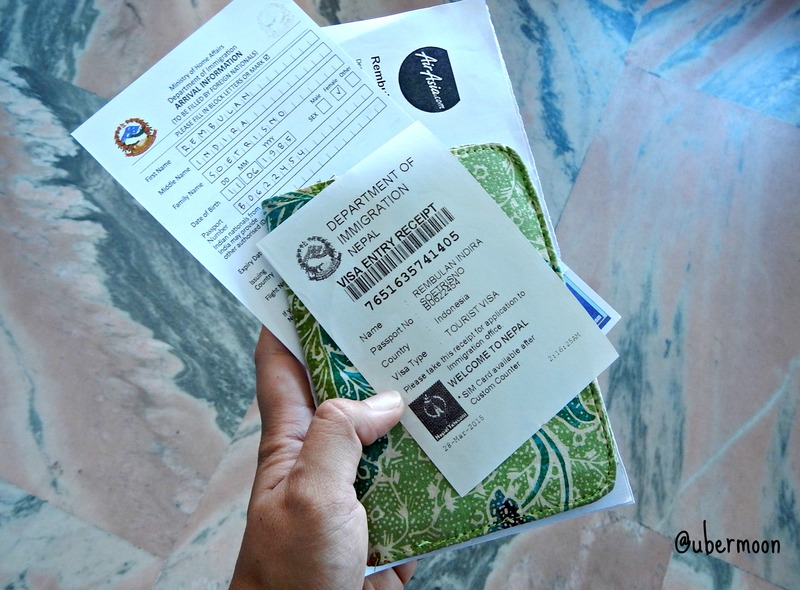 For that VOA Payment and Immigration, thanks to our smartness, we spent around 1.5 – 2hours. Amazingly, no one complained no matter how bizarre the arrangement is. 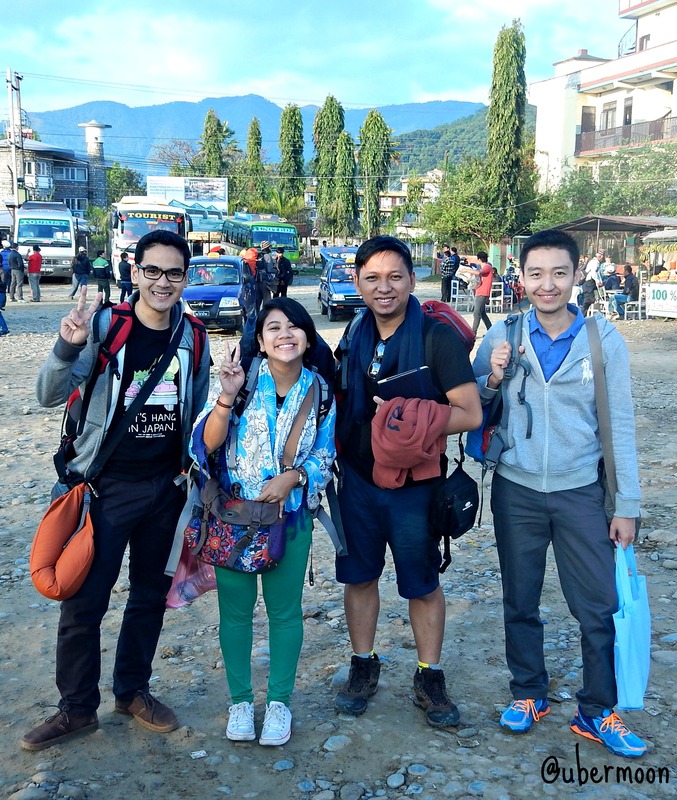 We spoke and chat to many other travelers and laughed like we’ve known each other for years. I think that’s the first good point about Nepal. Everything runs slow and easy there and people seem to not mind about it. Everyone is enjoying their minute by minute spent in this country! 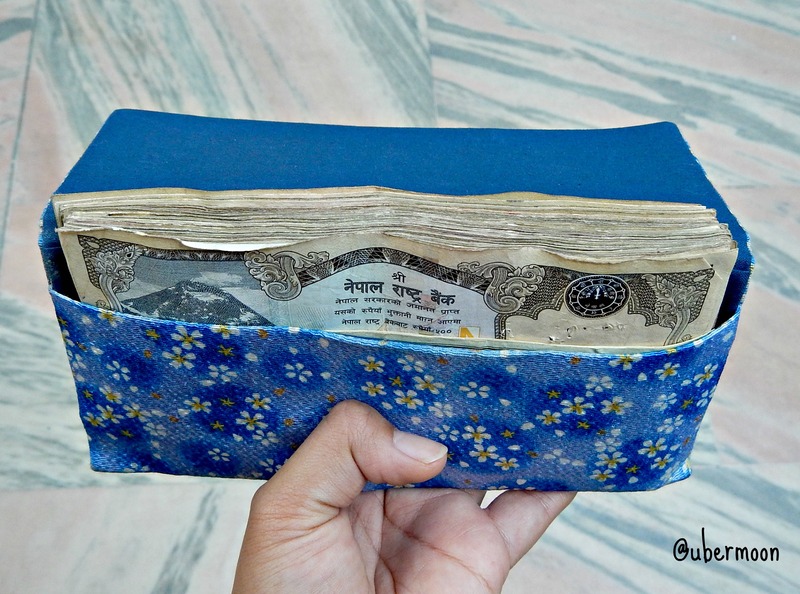 We walked out of the airport but stopped at the nearest currency changer first to exchange dollars to Nepali Rupee. It is true when people say that you’ll get a bunch of NPR (and feeling rich because of that) by exchanging several hundred dollars. HOLLAH!! We’re ready to rock NEPAL!! I stepped out of the airport and got shocked looking at lines of men outside the airport with placards on their hands. It was pretty hot yet those men were so full of spirit, raising the placards up high and calling the name printed on it. My skill from college time came out as I was skimming the placards and found my name in just a matter of seconds. I pointed to the man and Panji laughed. I might look like a predator looking at its prey when I did that. Hahaha. We followed the man to an old Toyota car at the parking lot. I walked slowly with an indescribable feeling inside. Can’t wait for running on an adventure in Nepal with these three guys beside me. I started this journey with a slow whisper and a smile. 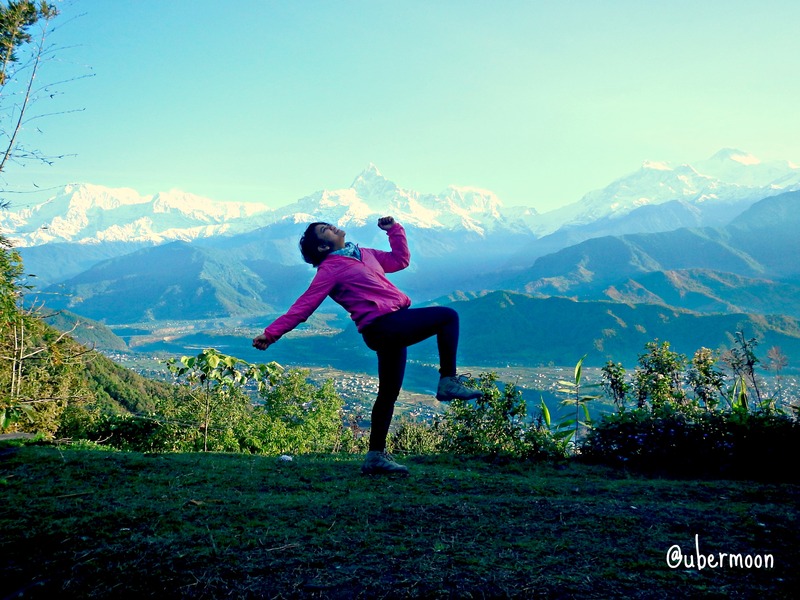 Namaste Nepal! Let’s make a memorable journey. Whaaaaa.. Thank you for reading Kak Fahmi. In the name of Lord, bisa lah sebentar lagi. 😀 Amin amin..
Hahaha. Kamu dong ajak akuuuuu. Hihihi..
Hahahaha. Mbak Noni lagi di mana sekarang? wah kereeeen.. baca postingan ini saya jadi penasaran sama *foto hasil webcamnya* ..eh sama nepal maksudnya 😀 Semoga. Huahahaha. Ubay!! Foto hasil webcamnya aneh. Akunya masih gemblok ransel gitu di fotonya. LOL. Hahahaha. Tapi #balikkampung ni aku udah makan Soto Betawi, Bubur Ayam, Mie Ayam, Sate Ayam.. Ya expect naik dua kilo dalam waktu dua hari ini lah. Hihihi. pengen banget ngetrip jauh sama mereka, semoga bisa kaya kak bulan. Selamat kak Bulan, aku tau rasanya jalan sama 3 bodyguard.. menyenangkan sekalih pasti !! Hahahaha. Scheduled already Njoooosss.. It was such a funny and happy moment yaaa. Macam orang pinter aja cengangas cengenges antri di yg pendek antriannya. LOL. Abis-abisan Kak! Kita jalan bareng lagi bikin foto kek gitu juga yuk Kak. Hihihi. Mariiiihhh!! Jadi jalan ke mana lagi kita? Aku pengen ke Tanjung Puting, Kaaaak. Tapi bisanya Juni. Hihihi.